Yum! Out of curiosity, where did you find that sauce bowl? Are you supposed to drain the green chiles? This looks delicious. I can’t wait to try it. Thanks for sharing it. Pinned for later. I can’t wait to hear how you like it. Enjoy! This has great flavor! It was a little salty for me. Will use mostly garlic powder next time instead of the salt. Not being critical at all! Will definitely make it many more times! Thanks for pinning it! I’ll definitely be trying this! It would be great over chicken enchiladas or a steak burrito! Oh I agree Cindey – Thanks for stopping by! Too salty. Tortilla chips are usually salty enough without the dip also being so salty. And I wonder if it wouldn’t be tastier using Monterey Jack instead of White American? It doesn’t have to be American, but from my experience, that seems to melt the best. If your is coming out thick and stringy, I would add more milk and cook it longer. I need the dip for a party (70 people) I’m having, and would like to use my 6-quart crock pot. Do you have a bulk recipe and can I keep it warm in a crockpot? I would just try to do the math. This makes quite a bit, so I would probably quadruple the recipe. Is it okay to use Velveeta? You could but it will have a different taste Brandy. Thanks so much Lisa! We just love this dip! Where did you find white American cheese cheaper than Velveeta? Where I usually shop, the white American is twice as expensive! Elizabeth, are you shopping in the deli section where you have it sliced? That is where I find it and normally it is much cheaper – especially when it is on sale. I have a insert that acts as a doubler boiler. This recipe sounds super yummy. I hate velvetta, it has so much yucky stuff in it. They do make the Mexican white cheese wheel at wal mart. Thats the very best dipping cheese. Perfect recipe, next time I’m gonna reduce cummin & use garlic powder. In deli this week 1 pound is $2.99 which is about what it is for velvetta 2lb cheese log. Have you ever read the ingredients, ewwww for sure. Made this for my roommates and they loved it! I also made a batch with a 2lb block of queso blanco Velveeta (broke college student here) for church. It was devoured in minutes, definitely need to make a bigger batch next time. There were around 70-90 people there. I didn’t increae the cumin, garlic salt, and chilis proportionally though. I found them slightly overbearing when I quadrupled the seasonings, but that’s just me! Thank you so much for the recipe! It’s a hit! I’m so glad you like it – yep, Cumin is one of those seasoning where you LOVE it (like me) or you need it in smaller quantities. 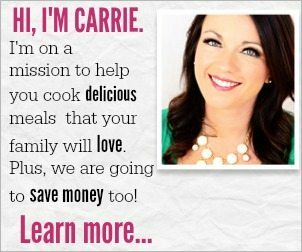 Hi Carrie, I’m planning on making this in a few days for three people. I’m trying to figure out from your pictures the amount of queso this makes. Could you tell me how much, cup-wise this makes? Thank you! oh I am sure the hint of lime tortillas were delicious with this dip Jason. Thanks for the comment. I would say this amount would be 6-8 people comfortably. We made this with another family (which was about 10 of us including small children) and we ate it all. Can I use the Kraft Single Slice white cheese? You can try, but I am not sure it will have the same flavor. Am i supposed to use ground cumin or cumin seeds? Can I use heavy whipping cream instead of milk to make this low carb or will it be too thick? sorry, but can you please tell me what is considered white american cheese. Is it pre prepared in slices, or only offered at the deli? Do you have a brand name as well? I have scoured our grocery and have not found any cheese labeled as white American cheese. Any help would be great, thanks. could I add sausage to make this more hearty? If so, what amount do you suggest? can this be made in a crockpot or do you recommend transferring to a crock after the last steps? I would say get the American cheese. We got colby jack and it isnt melting like it should. Its thick and ive put extra milk. I will do it the right way next time. I agree- the American works nicely and melts wonderfully. I recommend transferring it after you make it. I only find it at the deli and I have them cut it for me into slices. Ahhhhhh!!! Thank you so much for posting this! I believe this is going to taste JUST like the white queso that I love so much from my Midwestern roots! I live in Colorado now, and NOT ONE of the Mexican restaurants here has white queso. I’m so excited to give this a shot because I have really, really been missing it!!! Thanks! Oh you are going to love this Maddie! I made the white cheese dip, oh it was so good. I didn’t have the green chilies so I use a little crushed red peppers. Thanks so much for the recipe. I am going to try this but you can get the White american cheese at Aldi’s! Just made this for the kids no garlic but a little extra cayenne and they absolutely love it!!! I don’t have cayenne pepper….what else can I use? I do have pepper flakes and ancho chili pepper would those work? yes, I think it would work great. Made it this evening very good family loved it! After reading some of the comments I adjusted it a little to suit our tastes. We like it a little thinner so I ended up using almost 1/2 a cup of half & half instead of milk. Started with a 1/4 cup & added a little more at a time while whisking. Also, used an additional tbsp of butter just cause I didn’t feel like having 1 lonely tbsp left in fridge 🙂 It ended up having a delicious creamy taste & texture without being to thick. Also, I cut back seasonings to only about an 1/8 of a tsp of cumin & garlic powder instead of garlic salt. A pinch of cayenne plus a pinch more, then a little salt & pepper to taste after adding chilis. Again amazing & super easy to make! This recipe great. Do you have the recipe for the white dip that they serve with the Salsa and chip? We buy 5 lb. block at a place that services restaurants its $17 for the 5lbs. Can you just put it in a crockpot to melt over a few hours? Great recipe! The first time I made it, we thought it was much too salty for our tastes- esp since our tortilla chips also have a bit of salt on them– so the next time I just added a dash of salt to taste. It was much better! The cheese does taste like the dips at our restaurants! Now we know their secret! Can’t wait to make it for our party tomorrow! <3 Thanks!! Can I perhaps use Ranchero Queso Blanco cheese? I found it on sale today and bought it and trying to find a cheese dip recipe I could use with it to pour over some shredded beef tacos/ nachos! Thanks in advance. This is totally awesome, better than I have had in restaurants!!! Have a question, can’t you just use the Mexican cheese Quest instead of the white cheddar??? Just made this dip. It was s-o-o-o easy to make (always a plus for me)! Admittedly I don’t eat out much, but without a doubt, it is the BEST white cheese dip I’ve had! Agreed, it was a bit salty, as I only had garlic salt (not powder) on hand, and I didn’t use any “fire”. I used mild chilis and added no cayenne. Will tweak it a bit next time – and there WILL definitely be a next time . . . and a next!! Thanks so much for sharing! My son might say this dip is the best reason I’ve joined PINTEREST. I Was Wondering If It Would Be Possible To Mix In Things Such As jalapeno powder to give it a little more spice? THANK YOU, THANK YOU!! Definitely restaurant quality dip! I feel s-o-o-o fortunate to have found this recipe. Can’t thank you enough! Making it again today for someone special – can’t wait for him to try it. Will use garlic powder, less salt and look for chips with less salt. Since I discovered your recipe I’ve not even looked for another one. Thanks again! Tomorrow is election day and all my coworker’s and I (Poll Worker) have a 12 hour day ahead of us so we are potlucking it. I’m taking this dip. I can’t wait to eat it up! Can you add my name to your mailing list, as I don’t see a place to subscribe….. This dip is TERRIBLY addicting!! I just made it (the first dip I’ve ever made, btw). It was very simple to make & tasted just like our favorite Mexican restaurant’s queso! I used Kraft white American slices and they melted quickly and easily. I used garlic powder instead of salt tooo, however I don’t think it would be too salty with the garlic salt. so yummy!! Great Aaron, glad you loved it. One of my favorites. Just made this and it’s amazing! Did rotel instead of green chiles and added jalapenos. It’s great and will make it again!! Thanks Carrie, this is the closest I’ve found to the restuarant version. I tasted as I went and used 12 oz. of Velveeta Queso Blanco sliced cheese, almost a whole cup of whole milk and just a pinch of cayenne and cumin each. Also put the green chiles in food processor for a few pulses. PERFECTION! Thanks again. This will be a regular. Do you chop the Chili’s? The recipe is good, too much salt flavor. Will use 1/2 teas garlic powder and 1/2 teas garlic salt. Can I use pickled jalapeño instead of the 4 oz of the green chiles? Yes, I think that would work great, and surely give it some extra kick, Enjoy and let us know how it turns out. I just made this tonight & it is amazing. Closest I’ve had to my favorite restaurant! Thank you! This recipe looks amazing! I have made a similar dip that is heated on low in a crockpot. Can this dip be done in a crockpot so that it will keep warm? Our family loves Mexican food and I can’t wait to make this dip! Could you possibly use title if you don’t have the green chilies? This is great! The only white cheese I had was pepper jack and it worked great. I didn’t need the green chiles and just added another kick of cayenne pepper for my family that likes things spicy. I probably used at least 1/2 cup milk since they like it a little runny and not so thick. I added chorizo to it!!! So delicious!!!! Can I make the cheese dip the night before and heat in crockpot. I made this tonight for nachos. I did not put the cayenne in it as I thought it had really good flavor without it and we keep things pretty mild at our house. It was good. Will keep.. Did not add any milk to it. OMG this is great! I didn’t have garlic salt but I had garlic powder. PERFECT!! I’m off to buy a warmer now that I know I have yummy dip to serve. I had to freakin MAKE myself quit eating it with a spoon, lol! P.S. It’s low carb, too! Win! !